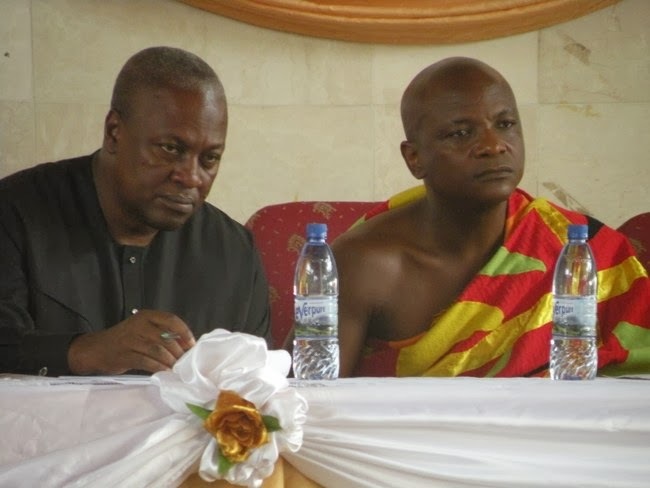 President John Mahama last weekend embarked on a 2-day working tour of the Volta region. The tour according to the president was to say ‘thank you’ to the people of the region and also to inspect ongoing projects as well as cut sod for new ones. The president’s first stop was the permanent site of the University of Health and Allied Sciences (UHAS) in Ho, where he inspected on-going construction of the academic and administrative facilities of the university’s Faculty of Biomedical Sciences. He directed the Minister of Finance and Economic Planning to release the counterpart funding of about GH¢3.2 million to ensure early completion of the first phase project which is expected to completedin 16 months. President Mahama also instructed highway engineers to work on the road to the university, adding that he had already given a directive for water and electricity to be extended to the site. Sod for the construction of the university was cut by late President John Evans Atta Mills and it is being funded by the Chinese Government. 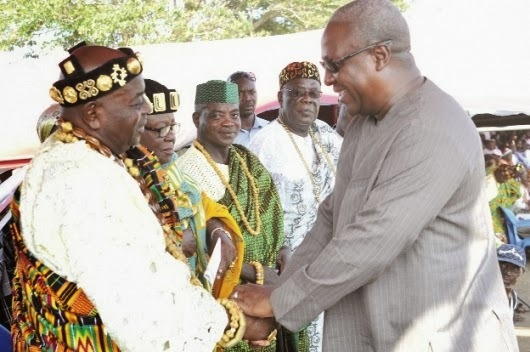 At a meeting with members of the Volta regional house of chiefs, Togbe Afede XIV, President of the House in a welcome address commended President Mahama for initiating a number of development projects in the Region, including the ongoing rehabilitation of the house of chiefs building and the completion of one of the three bungalows for the VRHC. He however appealed to President to release funds for the speedy completion of the projects. Togbe Afede who is also the paramount chief of Asogli traditional area, asked the president to expedite work on the upgrading of the regional hospital in Ho into a teaching hospital to aid the training of medical students by the University of Health and Allied Sciences. He also appealed to the president to consider the rehabilitation and expansion of the Ho municipal hospital into a modern hospital to serve the health care needs of the people. He further asked the government build an airstrip to link the Volta Region to other regions by air. Togbe Afede also commended President Mahama for the steps he had taken to eliminate corruption in the country, adding “Corrupt Officials are like termites and should be eliminated”. President Mahama in response said his government is committed to delivering on its mandate and assured the chiefs that all ongoing projects in the region will be completed and more will be added. He said, he had directed the Minister of Finance and Economic Planning to release money from the Eurobond account for the execution of the Eastern Corridor Road project, while the financial arrangement for the expansion of the Volta Regional Hospital into a teaching hospital was being finalised. He said due to the importance of the Eastern Corridor Road project, works on the various sections would be carried out simultaneously. He also said the government would spend GH¢ 470 million to absorb the 25 per cent of electricity tariff increases, saying it was necessary to mitigate the burden on the masses that were hard-hit. President Mahama explained that the tariffs adjustment was necessary to attract private sector participation in the generation of power to meet the 5000 megawatts target for domestic consumption and export. The President said the Region would also be a major beneficiary of the Chinese Development Bank loan, which would be used in constructing landing sites along the Volta Lake as part of the eastern corridor multi-modal transport project. President Mahama and his entourage also interactedwith traders at Ho Central Market, where he expressed disappointment over the non-start of reconstruction works at the market, one and half years after he launch the Ghana Urban Management Pilot Project (GUMPP), under which the market reconstruction was to be executed. He however assured the traders that work on the rehabilitation of the market would start soon. Addressing members of the NDC at the residency conference hall, president Mahama promised to perform in all the sectors of the economy to justify the mandate Ghanaians had given him for the next four years, despite the challenges that confronted his administration. 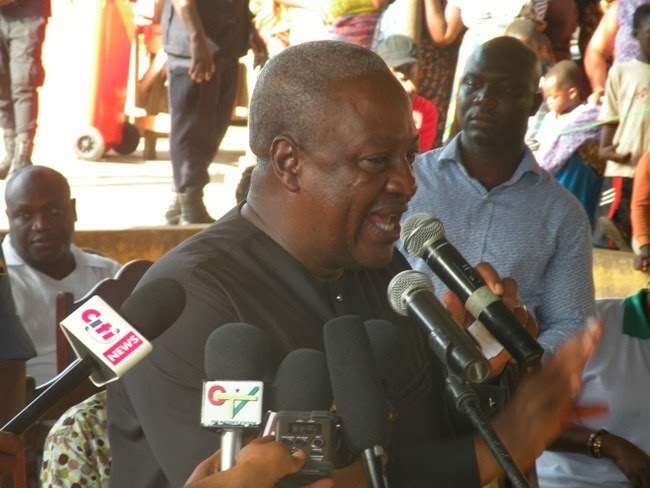 “The year started on a rather bad note, with series of fire outbreaks in our major markets, followed by the election petition, industrial strikes, energy crisis, among other issues, but thank God we are gradually getting out of them,” President Mahama said but added his government had drawn up a comprehensive programme that would address those challenges. President Mahama rounded up day one of his 2-days tour at Nkwanta, where he inspected progress of work on the eastern corridor road project and also addressed durbar organised in his honour. What ran through the President’s interactions with the people was the assurance that he would certainly deliver all the projects that he promised Ghanaians during the 2012 electioneering by the end of 2016. Since he was elected President in December 2012, Mr John Dramani Mahama has been dogged by some domestic challenges. The December 2012 election petition, labour agitation and general economic problems are some of the challenges he had had to deal with. The project, which would cost 900,000 Ghana cedis, would serve as a transit point for vehicles that would be leaving Accra to and from Togo and Benin. President Mahama said Aflao, as a transit point, deserved better and Government would assist and ensure that in all projects blossomed to serve the citizenry and beyond. From Aflao, President Mahama and his entourage went to Akplorwortokor in the Keta Municipality where he commissioned the first and second phases of the sea defence project and cut the sod for the execution of the third phase, which is scheduled to be completed in August 2014. President Mahama ended his two-day working tour of the Volta region with a durbar at Hogbe park at Anloga where pledged government’s support for the formation of the Keta Basin Development Authority to supervise the execution of development projects in the Keta Lagoon Basin. As a first step, he said, the government would initiate legislation for the establishment of the authority. Besides, he said, funds would be made available for the execution of projects to be spearheaded by the authority in the region. For instance, the President said, the Keta Lagoon Basin had the potential to produce salt, and for agricultural production. He said the failure of some chiefs and families to release land for investment projects was hindering development in the country. He, therefore, appealed to chiefs and families to release land for investments, since that would create jobs and promote the welfare of their people. Togbi Sri III, the Awoamefia of the Anlo State, said the establishment of authority was crucial for the development of the Anlo State. He thanked the government for the development projects in the area, including the sea defence project, and requested it to extend electricity to remote areas. He said the chiefs and people of the Anlo State would support any government that would be interested in the development of the area. The president was accompanied on the tour by Alhaji Baba Kamara, Senior Presidential advisor, Mrs Dzifa Attivor, Minister of Transport, Nii Laryea Afotey-Agbo, Volta Regional Minister , Mr. Douglas Prosper Bani, chief of staff and executives of the ruling National Democratic Congress.